David Bowie has never made it a secret that his ode to fatherhood, Kooks, was written after an inspired listening session to Neil Young’s After The Gold Rush. I first read about it in the very thorough (read encyclopedic) The Complete David Bowie, but have also read up on it at the top shelf and tireless Bowie Songs. The story goes that Bowie was listening to the record when he got the news that his son Duncan Zowie Haywood Jones was born on May 30, 1971. He allegedly wrote the song one day, and performed it a week later during a BBC Session. 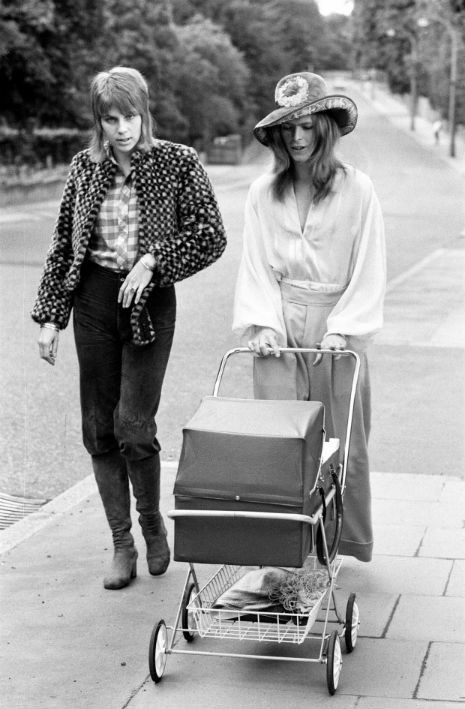 Just the idea of Bowie being in some sort of artistic seclusion somewhere, smoking a pipe, listening to vinyl while the mother of his child is in labor plays right into his mythology. Throw in a wall full of televisions and we’ve got an early draft of The Man Who Fell To Earth. Oh fatherhood. Here is a Pause Tape containing snippets of the two songs. The horn part in both songs are pretty similar, so it seemed like a logical splicing point. Posted in Uncategorized and tagged after the gold rush, david bowie, hunky dory, kooks, neil young, pause tape, the man who fell to earth, till the morning comes on February 11, 2015 by mgroesch2014.